Ever wonder where the term ‘hit me’ comes from in Blackjack? When you want another card at the popular 21 casino game, you utter the words ‘hit me’. Actually, technically you don’t need to say anything. You just need to tap the felt (or if you’re playing online, click the Hit button. But the act of doing so is the same as saying ‘hit me’. To be clear, you’re not actually hitting anyone. Nor is the dealer hitting you on the arm or across the face. That would just be silly. But that didn’t stop Jimmy Fallon and Jake Gyllenhaal from engaging in a version of Blackjack called Slapjack. The game is simple and incredibly entertaining. On an episode of the Tonight Show the other night, the two players faced off against each other with Gyllenhaal acting as the dealer. The goal of the game? To win the hand, just like at any land-based casino or at CoolCat Casino. Except there’s one tiny difference. Rather than playing for money, the two celebrities were playing for slaps. The loser of the hand would agreed to be slapped across the face by the winner. But not with any regular hand. No, Fallon decided to bring out a giant prosthetic hand that looked like it weight as much as Las Vegas casino bouncer post dinner break. We recommend watching the video because it needs to be seen to be believed. While Slapjack might seem a bit out there, it’s actually not that much unlike tournament Blackjack, or a once-popular form of Blackjack called Elimination Blackjack that took the world by storm about 10 years ago. Part of the Ultimate Blackjack Tour, Elimination Blackjack saw several players go head to head against the dealer in an elimination tournament format. Essentially, players were slapped out of the tournament at certain intervals. During certain rounds, the player with the fewest chips was eliminated. Players who couldn’t make the minimum bet at specific times were also eliminated. And of course, if you busted out, you were booted from the tournament. Now-defunct online poker site UltimateBet offered online Elimination Blackjack tournaments during their heyday. They even did an advertisement for it that shows players being booted out of the tournament, mob style. Today, Elimination Blackjack tournaments are hard to come by, but you can definitely play Slapjack at home with your friends. We recommend warning them before you slap them, or that could make for one horrible misunderstanding. 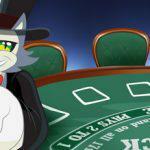 Did we get you in the mood for Blackjack? 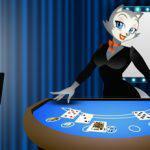 You’ll find a number of different Blackjack options at CoolCat Casino, including the classic game you love and a few variations with different side bets. You’ll also find live dealer Blackjack where you’ll get to face off against a real dealer. It’s all done through the magic of live video and we promise the dealer won’t slap you. You need the downloadable software to play the live dealer version, and it’s only available for Windows machines right now. On a Mac? 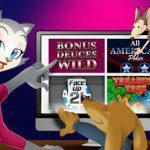 You can access Instant Play and enjoy our traditional Blackjack games. On the go? 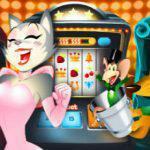 Head to online CoolCat Casino from your mobile device and bust the house wherever you are.